The signs pointing to the “danger of bears” had a rather alluring effect on me instead of warning me. Many years ago, I had already unsuccessfully tried to spot a bear in the wild when I was at Yosemite National Park in California. Now in Romania it had to work! 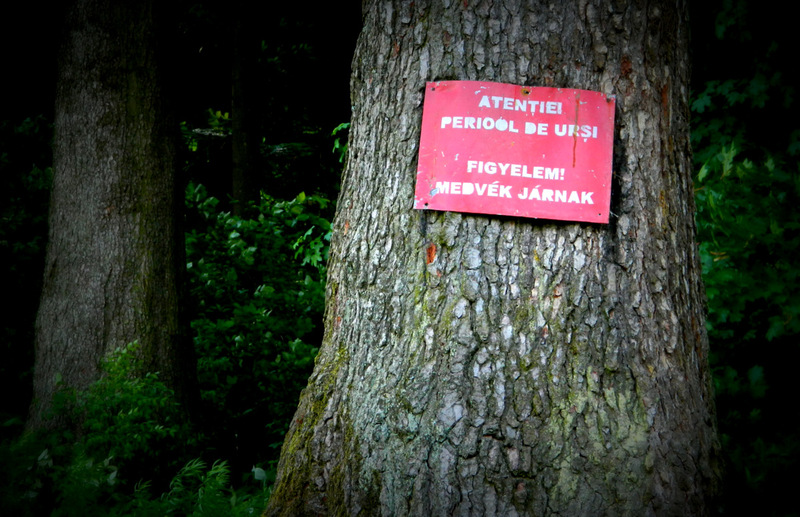 So, for the past few days I spent as much time as possible in the forests around Băile Tușnad in Transylvania. All Friday: negative. Saturday: negative. My disappointment grew. 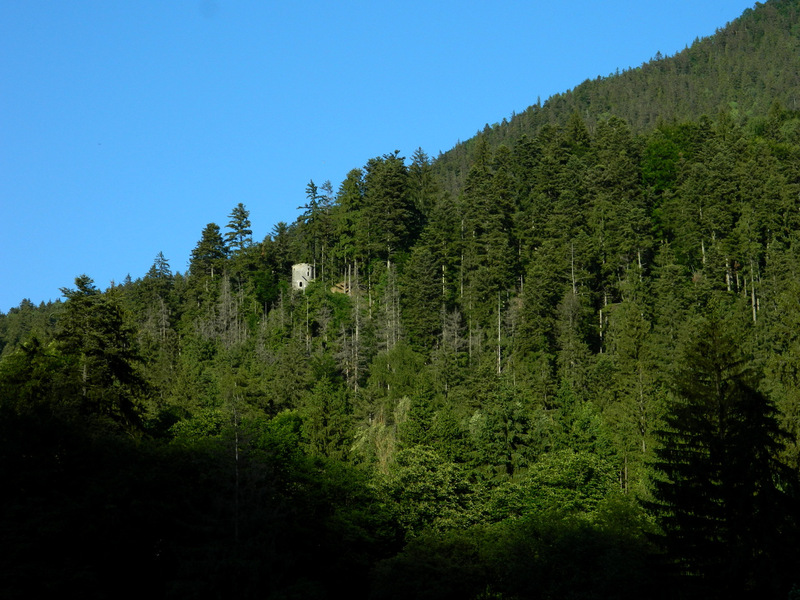 Sunday: Without much hope, I walked towards a fortification tower in the forest above the town before lunch. I would have to depart in the afternoon, so I didn’t have much time left. 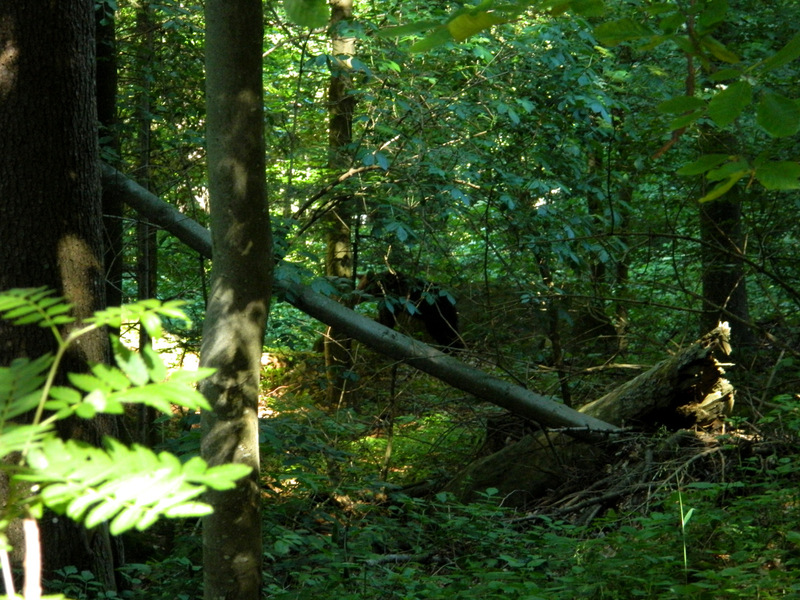 I was walking without making any sound, placing my steps carefully and not stepping on any branches that could break. To make sure that nothing escapes my eyes, I even wore my glasses. Only a few minutes outside of the town, I heard a rustling to my left, in the forest. A few moments passed before I recognized it. It was indeed a bear! 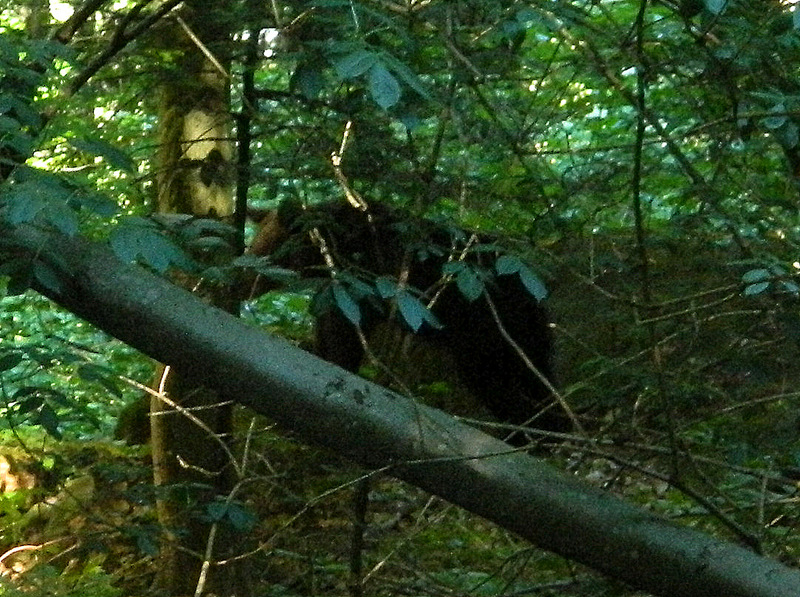 The first photo shows the distance between the bear and me (around 50 meters/yards), the second one shows the bear’s contours a bit more clearly. I stood there rooted to the ground. My legs were shaking. My heart was beating frantically fast. Should I remain, run away or slowly turn the other way? As always in such situations, curiosity prevailed over fear, the existence of which I wouldn’t want to attempt denying. So I filmed the bear, unfortunately only for a few seconds before it disappeared in the green thicket without having noticed me at all. Despite the brevity of the encounter, I was overwhelmed. Such a beautiful animal, so cozy, but so majestic at the same time. Lion, tiger and elephant may argue about who is the king of the jungle; the king of the European forest is undoubtedly the bear. I needed another few minutes until my pulse and my breathing had normalized. Probably, I stood there in the middle of the forest with a sense of happiness clearly visible all over my face, as if I had discovered a treasure. I continued towards the direction in which the bear had walked off, still making no sound, camera ready. But unfortunately, I met neither this nor any other bear. On the way back, I crossed paths with three young Romanians who asked me for the way to Apor Tower. I mentioned the bear and showed them the video which I had just recorded. They seemed almost excited, definitely not alarmed, and went off in the direction of the bear’s last known residence. Afraid of bears? Not the people here in Transylvania. But then, it’s easier to be brave when you are three. This entry was posted in Photography, Romania, Travel, Video Blog and tagged Baile Tusnad, bears. Bookmark the permalink. Congratulations on seeing the bear! And congratulations on the bear not seeing you! That would give me a heart attack and probably dissuade me from going into the forest for a few years. I am however afraid that it will happen when I’ll be in South America. Haha! I like to keep it easy for my readers. And much cuter images than in “Snakes on a plane”. Rabies risk.. And …if the bear had attacked you…would it be shot? I think so.